Ask locals to name their favorite place to go for the best grilled meat and fish and the name you’ll hear most often is Hamilton’s. Hamilton’s is truly a Hidden Gem. In fact, if you don’t have clear directions, you might never find it because it’s hidden at the end of driveway between buildings, on a back street in Lambertville. But keep looking, because it’s worth the trip. Find the Neon Sign for Finkles Hardware then look across the street and you’ll see the tiny sign for Hamilton’s attached to the red brick wall of the right building along the alley. To say their marketing is understated is an exaggeration! Take the time to find this little alley and walk down to the end where you’ll be rewarded by a great meal prepared by a staff that clearly loves food as much as the owners, Jim and Melissa Hamilton. Jim Hamilton is a local icon, known for his generous social contributions as well as helping to make the region a culinary destination. 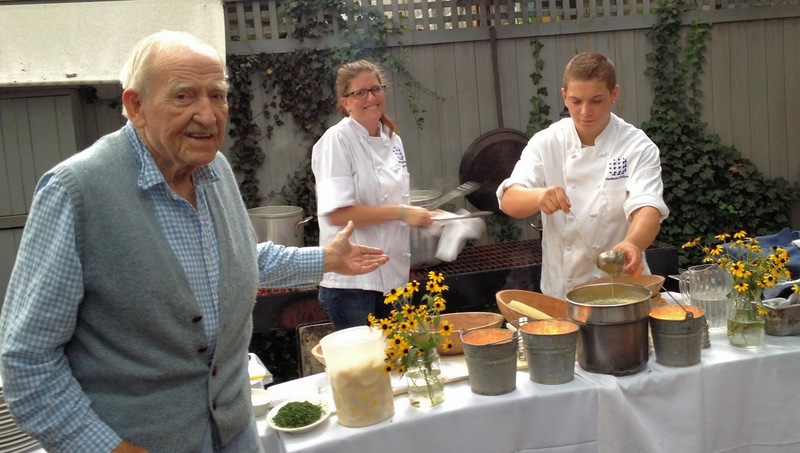 He is also recipient of the prestigious James Beard Award for outstanding contribution. Daughter and co-owner Melissa has also made a name for herself in the ‘biz as food editor of Saveur and author of the Canal House Cookbook series. If that weren’t enough, Hamilton’s other daughter, Gabrielle, is author of the New York Times bestseller “Blood, Bones and Butter” and owner of the famed New York restaurant, Prune (and associated eponymous cookbook). There’s definitely food in this family’s DNA! Their current Steak and Oyster menu recalls Hamilton’s roots in grilled meats then augments it with modern favorites like burrata cheese and oysters on the half-shell. As their tagline states: “All that’s good & grill-worthy.” Ever understated. What they don’t mention is that their locally sourced steaks are considered to be among the best available. Grass-fed steaks from Tullamore Farm and Griggstown chickens are treated with respect and grilled to perfection, served with flavorful, buttery sides, it’s comfort food at its best. Evy always eats with gusto when we go to Hamilton’s! In addition to their dinner offerings, Hamilton’s is open for lunch on weekends during the busy summer season, offering a special lunch menu. Their delicious lobster roll (something not often found outside of New England) is a favorite. And the duck BLT gives a meaty twist to a well-known sandwich. Of course, they have a burger, albeit with a European flare: gruyere cheese, bacon, lettuce, roasted shallots and creme fraiche. You really can’t go wrong here. 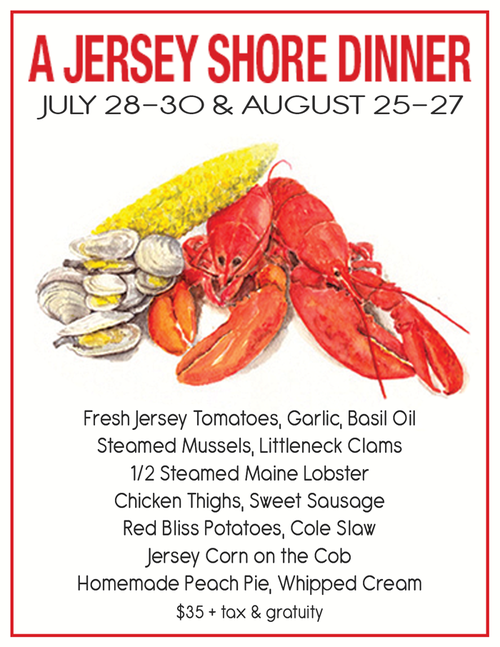 You’ll also want to keep a lookout for Hamilton’s special events, such as the always-sold-out Jersey Shore Dinner (this year July 28-30, 2015). 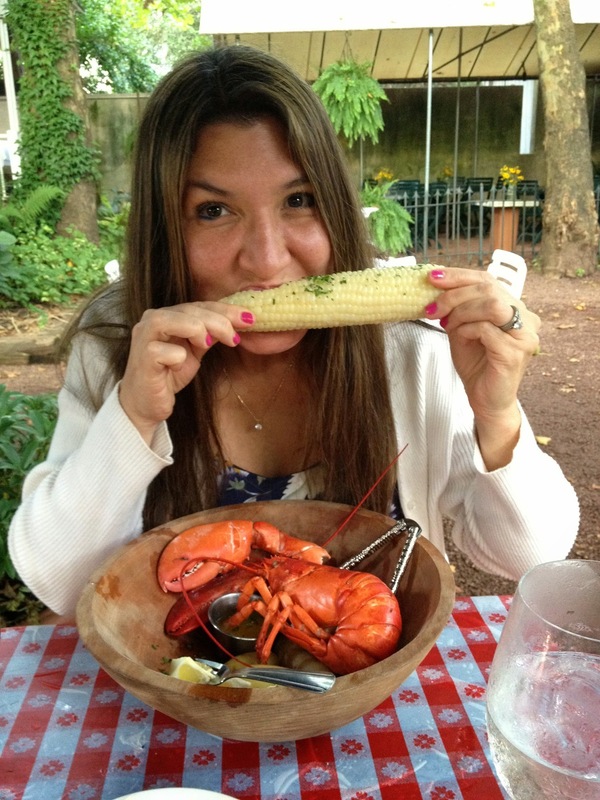 Maybe it’s because I grew up on Cape Cod that a love of the lobster boil holds a place dear to my heart. Or maybe it’s just that it’s darned good food, prepared and served by people who care. Whatever it is, it must resonate with a lot of people because it’s one of the most popular summer dining events in the area. Lobster. Clams. Jersey corn and peach pie. it’s the type of meal that brings a smile to your face as you dine on the patio with good friends and enjoy a great bottle of wine. Hamilton’s is the type of place that you can easily forget, but it’s worth remembering. Put it on your short-list of restaurants to visit when you’re in the area. Once you’ve tried The Grill Room, you’ll certainly be back for more. Keep in mind that Hamilton’s, like many local restaurants, is BYOB. But unlike most BYOB places, Hamilton’s has a sister establishment, the Boat House, conveniently located just across the courtyard. The Boat House is a lovely little bar, with some outdoor seating as well as a couple of nautical themed interior rooms. It’s a favorite place for friends to meet for a drink while lounging on the sofas and reminiscing about great times. This review really captures the essence of Hamilton’s Grill — nice!